If you are looking for information on the Teddy's Bigger Burgers franchise business opportunity, Teddy's Bigger Burger franchises or Teddy's Bigger Burgers franchising, then you have come to the right place. Our Guiding Principles revolve around one burger, one customer, and one experience. The result is that of a company that approaches modern trends and concepts, through basic business values: Listen to our customers, listen to our employees and be dedicated equally to both. Nothing complicated in design, execution of product or policy. We satisfy our guest's needs by serving a pure burger and we satisfy our employee's needs by being coaches and mentors, not bosses. The passion and commitment behind the principle beliefs that guide Teddy's Bigger Burgers will not only serve generations to come, but also perpetuate the values and work ethic that produce great leaders and industry giants. Teddy's has been providing Hawaii award winning Burgers for over 10 years. 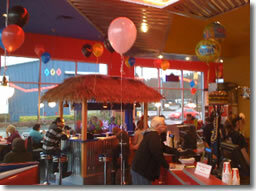 A Teddy's Bigger Burgers Restaurant offers an opportunity for our franchisees to "Reinvent The Burger Joint." Teddy's makes burgers the old fashioned way. Burgers are served in five, seven and nine ounce sizes, on a soft potato bun and are flame-grilled to order. If you would like your burger cooked to "medium," that is how it is served. Beef is 100 Percent Choice Ground Chuck with no binders or fillers. The meat is loosely ground, portioned, and packed off-site using Teddy's proprietary methods. At the store, crew members hand patty and cook to order. The Super Sauce™, Teriyaki Sauce, and spice blends are great proprietary additions that keep us unique. 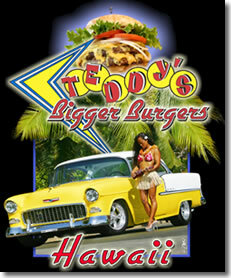 Teddy's continues to be voted Best Burger from 2001 - 2009 by Honolulu Magazine, Honolulu Star Bulletin, and Mid-Week. A true passion for Teddy's product, concept and operating philosophy. A true desire to serve and please guests. Restaurant and management experience is a plus. Comfortable following an established system. The Key Manager or operating partner from any franchise group must have significant restaurant management experience. Franchisees will excel at Teddy's operations procedures and leadership standards. Above average supervisory, communication and leadership skills. Ability to adapt or mold past experiences into Teddy's unique operating style. A strong work ethic coupled with honesty and integrity.